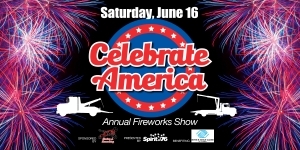 Bring the whole family and join us for THREE fireworks shows in one night at ATR’s Annual “Celebrate America” show. Entry is $15 per car ($20 per car after June 6th). Tickets are now available for purchase at https://everyeventgives.com/event/celebrateamericaspiritof76/. We’ll be accepting cash only for ticket sales at the gate. A portion of all proceeds will go to Boys & Girls Clubs of Columbia.